For pet stain removal from rugs, general cleaning is not enough to eradicate the pungent odor. We offer an additional service called “Pet Urine Extraction” that entails several comprehensive steps to neutralize the pet odor and remove pet urine from your rug. For the best result, we recommend that you bring your rug in right away. The rug type and amount of urine damage determines the particular steps needed. Most hand knotted rugs that have no backing will undergo a technique where the rug is fully soaked which allows the water to flush the urine out of the rug. A specially formulated and environmentally safe neutralizing pH balanced enzyme is then applied to neutralize and remove pet urine odor. Your rug is then scrubbed to break down the lipids and neutralize the urine salts. After that, your rug is thoroughly shampooed, rinsed and hung up to dry. You can also opt for rug deodorizing for an added measure of freshness. We use the very latest, up-to-date rug cleaning products and equipment that are approved by the Carpet and Rug Institute (CRI). Our specialized rug cleaning technique has several comprehensive stages so you can be assured that our process is done thoroughly and with the utmost care for your rug. The rug cleaning method used depends on the rug type, and we offer additional services as needed. All of our services are performed right here in our rug cleaning facility located at Mark Gonsenhauser’s Rug and Carpet Superstore, and your rug while on our premises is fully insured. 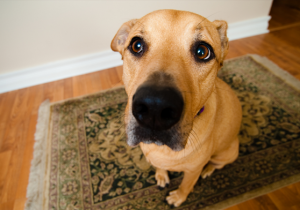 Call us today at 757-333-1010 for a quote on pet stain, urine & odor removal from your rug or carpets. Pick up and delivery is also available for a reasonable fee. Proudly serving all of the Hampton Roads area; Virginia Beach, Norfolk, Portsmouth, Chesapeake, Suffolk, Hampton, Newport News, Williamsburg. We also pick-up and deliver to parts of the Eastern Shore and Northeast North Carolina. Call 757-333-1010 to schedule an appointment for a pick up. Call 757-333-1010 for more information or to schedule a pick up for rug cleaning. We proudly serve all of the Hampton Roads cities; Virginia Beach, Norfolk, Portsmouth, Chesapeake, Suffolk, Hampton, Newport News, Williamsburg. We also pick-up and deliver to parts of the Eastern Shore and Northeast North Carolina.